This column always loves a good political protest movement in our neck of the woods, so you know we had to pull over today to interview the anti-Obama guys who had set up shop outside Cumberland Farms on Main Street in Buzzards Bay. It's not every day that you drive down Main Street in a small town and see the President of the United States on a poster with a Hitler mustache, but today was the exception. It turns out that the two guys were supporters of Lyndon LaRouche, the perennial presidential candidate and political activist. They spoke with me about Obama's Syrian follies, the repeal of Glass-Steagal, the military/industrial complex and so forth. 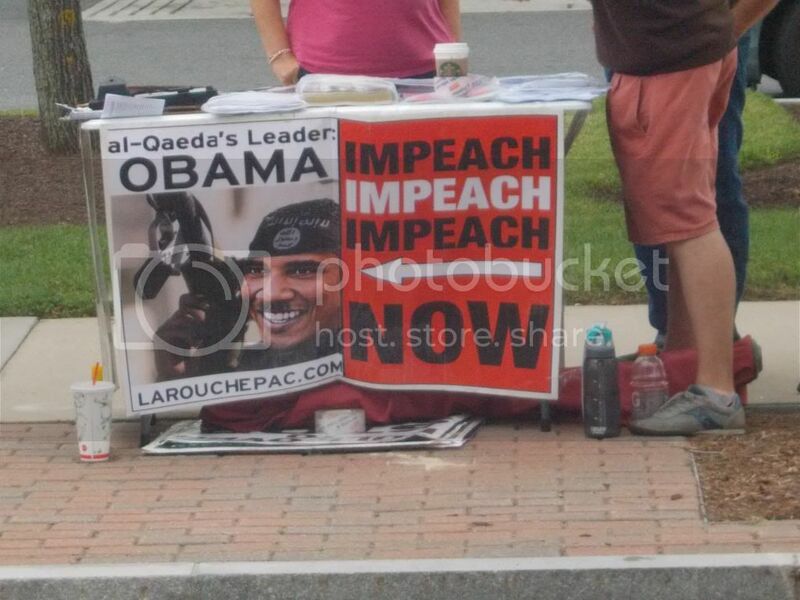 LaRouche has some strong views on how the elite control the world and so forth, probably 100% true but bound to encourage spirited debate on street corners when accompanied by a poster that shows a sitting US President dressed in full terrorist regalia. The demonstrators were nice enough, answered my questions reasonably, had me sign up for a newsletter or something, failed to get a cash donation (I dress like a blogger, and me saying "Do I look like I have money?" while pointing down at however I'm dressed that day is usually enough to discourage solicitation, to the point where homeless guys have offered to buy me a burger), gave me some pamphlets, thanked me for my time, and I was on my way. I really would have hung around if I didn't have to get the kid off the bus, as people were shouting him down every ten minutes or so that I was there. He did have an older couple come up and nicely ask about stuff, but he also had a guy pull his truck over in a hurry, get out, and start screaming "What's wrong with you f****ing people???" If I hung out at 5 when the workingmen were coming home, I'd only need one liberal roofer or even a Republican-but-patriotic contractor seeing that Hitler sign in order to have a right-in-front-of-the-reporter Main Street fistfight. I was kind of hoping to have a Bush/Obama fight with the demonstrators, but he was also anti-Bush. 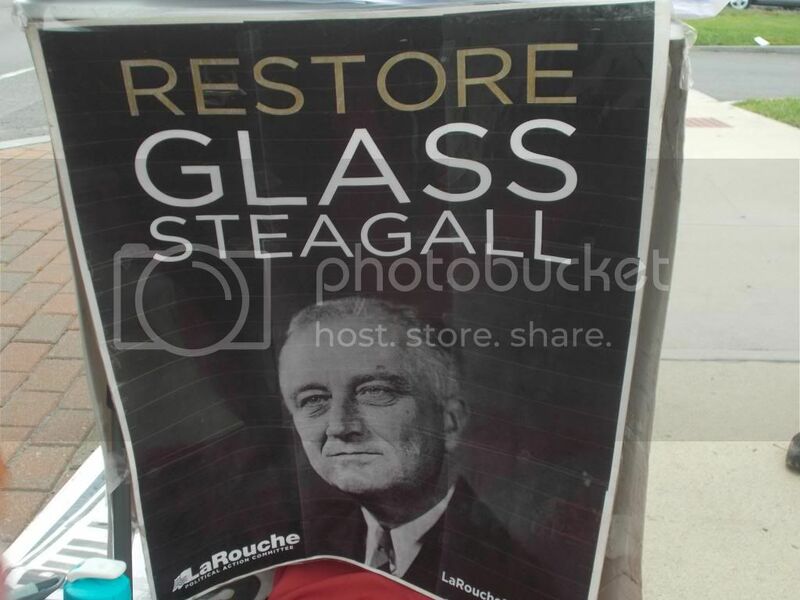 LaRouche people favor an FDR sort of President, and we haven't had one since, uhm, FDR. He had a very calm speaking voice, and wasn't there to push buttons on people... other than his hey-look-at-me signs that even money says will get him punched in the face at some point today. As for myself, I like to see a little political action in the streets now and then. I hope the people stay safe, and that anyone who is angry with them exchanges ideas with them instead of punches. I suppose they'll be there all day. They're right across from the local cop house, so they'd have been shut down by now if they were doing anything illegal, I suppose. Go on down and take part in the extracurricular part of the political process. 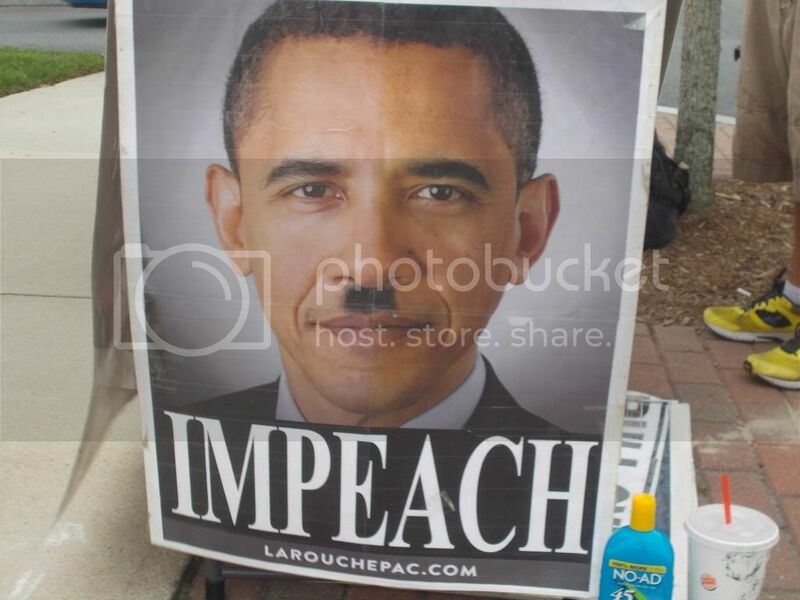 It's what Lyndon LaRouche would want, and it was just his birthday, so hook the brother up.